International expositions and tradeshows provide companies a unique platform to showcase their products and solutions to customers. Attention-getting booths and exhibits are the "soup du jour" for the typical exposition audience. The more engaging the booth, the better the potential for a greater return on investment for the exhibitor’s tradeshow efforts. Companies know the right partnership can give them a winning edge. That’s why so many companies choose Mahaffey. 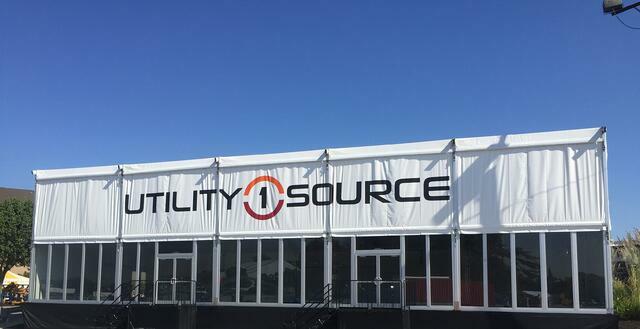 With over 90 years of experience in turning ordinary spaces into extraordinary, Mahaffey is the partner relied upon to deliver that one-of-a-kind temporary structure that’s certain to impress on a grand scale. Mahaffey was recently approached by an industry leader in utility and construction equipment. 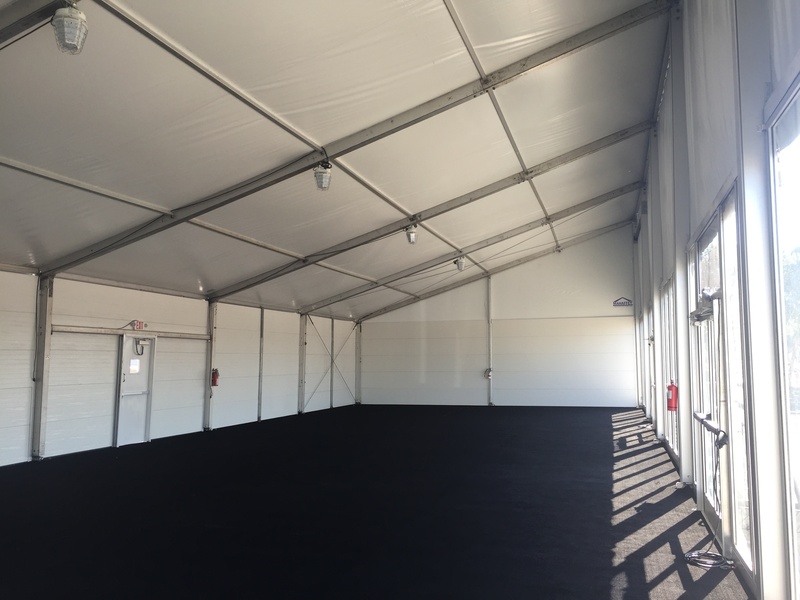 They proposed an incredible task: They wanted to create a custom temporary structure display for their vendor exhibit at an international exhibit. The primary requirement? The structure had to stand out! The client envisioned a stunning building with a huge logo and other amenities designed to attract attention. They presented their vision to Mahaffey’s team. They asked Mahaffey to produce a design from their initial idea that would set them apart from the other exhibitors. The final product should provide an attention-grabbing exterior and an interior space that would provide a comfortable setting for meetings with potential customers as well as an incredible view of the client’s equipment in the exposition lot outside. There was one key challenge to overcome, though: The space provided to the client at the trade show was on a steep slope. The tent structure needed to be designed to conform to the terrain. Mahaffey’s designers presented a computer-aided design (CAD) drawing of the proposed structure to the client. The CAD drawing allowed us to show the client a photorealistic 3D view of how the final design would look. The drawing made it much easier to imagine, plan, approve or make any updates before the actual structure was created. The final design solution depicted a striking custom built lean-to structure that conformed beautifully to the lot size and slope. The front of the structure boasted glass walls that created a picture window effect and provided a view of new and showcased equipment in the exposition lot. The interior floors were carpeted, and an HVAC system was installed to provide an ideal meeting environment for guests. 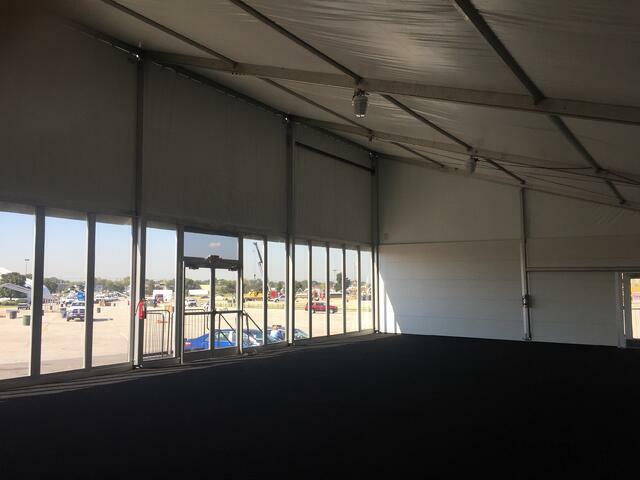 An attention-getting logo was designed to stretch across three bays of fabric at the top of the structure. The graphics were installed off-site, and every other aspect of the structure’s installation occurred on-site, executed by Mahaffey’s expert installation team. The result of the custom structure proved both interesting and inviting, and was a huge success for the client. The visibility of the client’s structure brought customers from near and far at the expo. Additionally, they were able to showcase their product line on the exterior while greeting guests inside the lean-to structure. Being extraordinary takes planning. 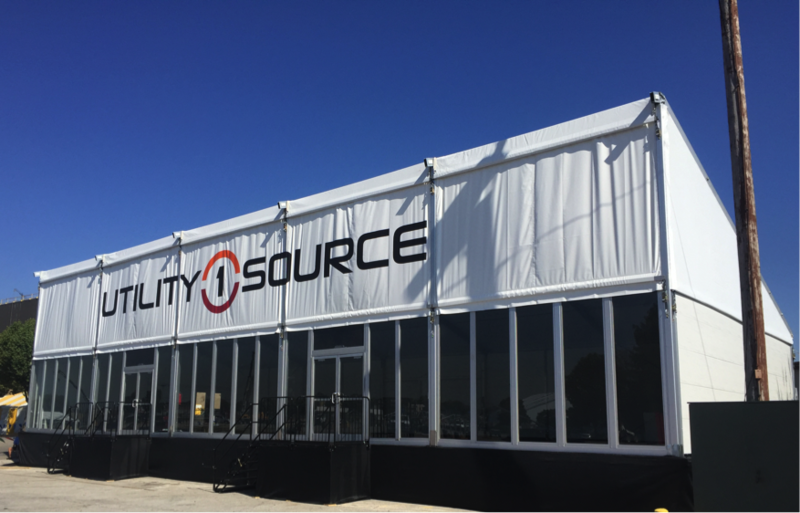 At Mahaffey, we’re delighted that we have over 90 years of expertise and experience in helping our clients plan and install impressive exhibit structures like this one for an international exposition. We look forward to helping you plan your next big event!